More recently we developed and released WebMAP to move desktop (C#/Winforms/.NET) apps to a modern web architecture. Because this is such a major paradigm shift (desktop to web) it leaves some desktop developers scratching their heads a little when they look at the migrated code and wonder "where's my class/form/event handler/etc.?" First of all there are a lot of differences between a Windows app and a web app, not the least of which is the physical separation between client and server. I wrote about some of these issues here; if you're unfamiliar with web development this is a good place to start. In this series I want to explore the architecture that WebMAP creates following a migration. Since we are using a hybrid pattern pieces of it may be familiar to you but overall some explanation is called for. First of all, let's clarify exactly what we mean by the word "WebMAP:"
An architecture of the new, migrated app. The tool is proprietary; the helper classes are included in the created app and are easily read for understanding; the architecture is the subject of this (and subsequent) blog posts. Note that you probably won't need to spend a lot of time with the helper classes as they handle the "under the hood" stuff to make your app run. At least some familiarity will be helpful when you are debugging your app, however. As I mentioned above, the key difference between a desktop app and a web app is that the web app (and by that I mean the kind of modern web app we create) is a multi-tier application that is divided into a front end (i.e. client running in a browser) and a back end (server running remotely in a datacenter or cloud). Another key difference is that on the desktop you normally have a single user with a dedicated execution thread and on a web app the server needs to handle multiple requests all sharing an execution thread. Those two differences make for lots of changes in the app architecture. Remember we are talking about applications on the browser, not web pages. Web pages--even interactive ones--are pretty simple compared to re-creating the functionality and UX of a desktop app in a browser. For our discussion it's helpful to assume any app we are talking about is heavily forms-based with a database back end. 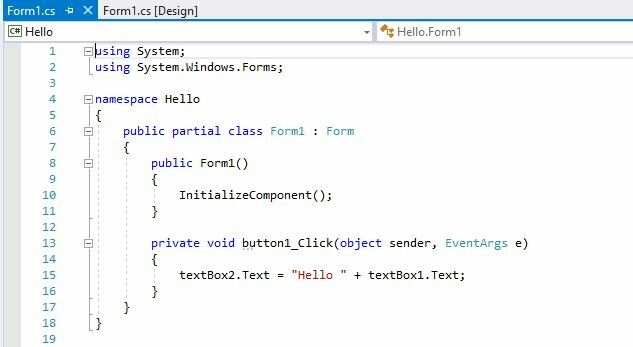 In a Windows application a traditional way to handle these kinds of apps was a "code-behind" approach where events on controls triggered handler code. Even older ASP.NET ("classic") apps using webforms supported this paradigm. The back end of the app will still consist of C#, but we are going to use ASP.NET Core and construct a single page application (SPA) instead of a multi-page app. Single page apps differ from more traditional web apps in that they only have one web page (URL) that is refreshed dynamically. A "normal" web app switches from one page to another with each user action. SPAs rely on AJAX to allow the page to refresh without having to wait on a page load from the server (the "A" in AJAX stands for "asynchronous" which means stuff happens without the user having to wait). When this code runs, the value of the variable aboutMessage will be inserted into the <p> element so the text the user sees will be "Welcome. This is the about page." AP.NET MVC creates--assuming you use the Visual Studio app template--folders for your models (the data representation), Controllers (the traffic cop for routing URL requests), and Views (the presentation the user actually sees). By default the template does not create a Single Page Application, instead using URLs like /index and /about to return fully-built pages to the client (browser). The difference between a Single Page Application (SPA) and one that isn't, is that in an SPA we don't rebuild the entire view model with every request. This is great for actual applications (not web sites) where typically a request is to fetch some data used in part--but not all--of the page. Refreshing only that part of the page reduces the load on both the server and the client, as well as reducing the chattiness of the app. You can get a rich (but complex) template for these using ASP.NET Core with Angular, which has the added benefit of being server agnostic, so it can run equally well on Linux and Windows. The Web API template is really a way to create RESTful endpoints you can hit with HTTP requests using JSON. Web API is a simpler, faster, more lightweight method of moving data back and forth from a web server to a client compared to SOAP/XML web services. The Web API scaffolding doesn't really provide you much help in creating your client side code, event listeners, or look and feel. That can be done using classic Angular components, or React or Knockout or whatever you want. Plus HTML, CSS, and possibly some component library to create controls/widgets, such as Progress Kendo, or Syncfusion, or whomever. Ok, so where are we exactly? Right. It's complicated, isn't it? From our perspective, here you are with a desktop app (could be VB6, could be PowerBuilder, could be C# with WinForms), and you want a web version. Desktop apps are so 2000s. But to get that desktop app to a web version is hard. Sure, you could rewrite it into one of these patterns (or some other--we haven't touched Java, for example), but they are really complicated.